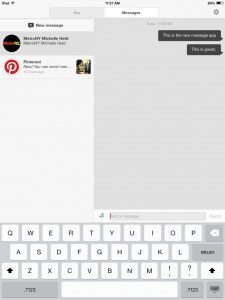 Pinterest announced a new messaging feature today. Their brief introduction to the new messaging system touted that they wanted to, “easier for you to have a good old fashioned conversation”. I am not sure how Pinterest or any social media platform falls under the banner of old-fashioned but nonetheless, messaging is a long overdue add on to help make this platform more social. Rather than pinning alone, users can now communicate with each other. It’s not Snapchat for adults! Pinterest actually had a commenting feature. The new messaging feature is a little different. Users can go to a pane to separate pane to see just their messages. In the past, the only way to talk to someone was with comments that were quickly buried and lost in an account with a modest following. To demonstrate the message service, I took screenshots from my Pinterest account on a desktop and an iPad. The service is also working on Android devices, one of the first times we have seen a new feature roll out across all platforms at once. 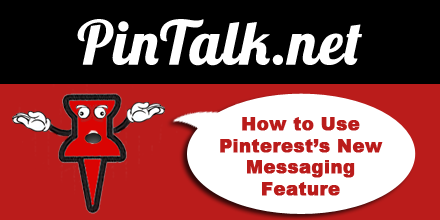 So here read on and learn to use messaging on Pinterest. To view your messages, click on messages at the top of your mobile device menu (Figure 1). On a desktop, click on the menu in the upper right corner of your screen (Figure 2). To start a new message, tap “New Message” and then choose a recipient. 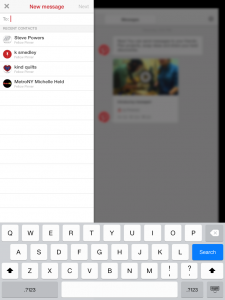 After clicking on their name, click “Next” to and enter text in the box that says “Add a message.” Below is a screenshot of an iPad (Figure 3). The “Add a message” box is at the bottom of the screen. On a desktop, users start a new message by clicking on the plus, “+”, sign at the top right corner of their screen (Figure 2). On a mobile device, your messages appear on the messages pane. To see them, click “Messages” on the top navigation bar (Figure 4). You can also check for messages through your account setting menu. Click on your profile name in the upper right corner of your screen. Then click “Messages” on the top navigation bar (Figure 6). 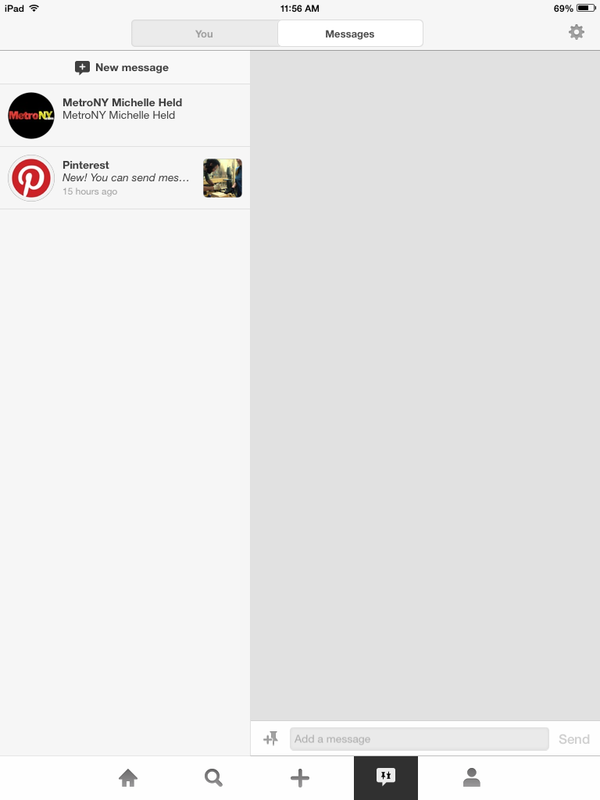 Pinterest users still have notifications and comments which are read from the account menu. 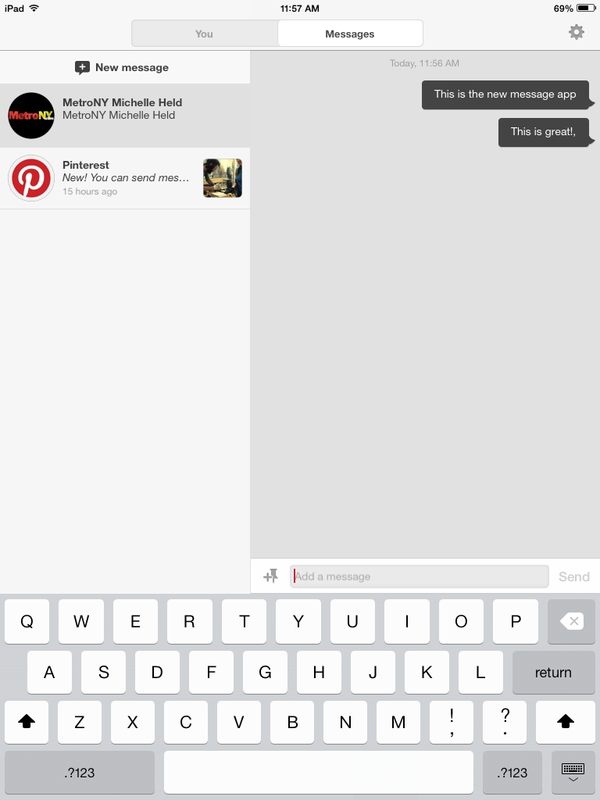 Pinterest messages are a new feature in addition to notifications and comments. They appear on their own viewing pane on both mobile and desktop devices.